More and more evidence is surfacing that Laleh and Ladan Bijani's death was financially motivated. Many doctors and their adoptive parents (Safaian family) who raised them for twenty-seven years were against their surgery. It was only after the terrible surgery that the media voiced people's concerns. The Raffles Hospital has not provided accurate information about the twins. The hospital site (http://www.raffleshospital.com/bijani/bijani.asp) mentions that the twins were born in 1974 but in fact the twins were 31 years old of age when they passed away in July 2003, as they were born in 1972. The Safaian family adopted the twins when they were about three years old. Dr. Safaian took Laleh and Ladan (with permission of the orphanage where they were staying) to Germany for possible surgery before adopting them in 1975. The tests indicated that the twins would not survive if the operation were to be performed at that time. The chance of survival was only one percent then and, according to Dr. Safaian, remained one percent at the time of their death. Safaian's parents raised the children for ten years, and then Dr. Safaian's brother's family adopted them and provided excellent living conditions for them. The children had comfortable accommodations and were able to finish high school and enter Tehran University's law school (despite the fact that the entrance examinations for the law school are very difficult). 1. Why the Raffles Hospital took the twin's brain without permission or without informing the public of this action? 2. Why Dr. Safaian's family who raised the twins for 27 years was not consulted? 3. Why Dr. Safaian was not invited to be one of the participating doctors? 4. Almost 2 1/2 years ago, Laleh and Ladan left the Safaian family and changed their last name to Bijani. Was this necessary? 5. Were the twins provided with psychological counseling? 6. Dr. Benjamin Carson of the Johns Hopkins University had said that their chance of survival was 50/50. But when he was asked if he would allow a 50/50 operation to be performed on him, he had said: "no way." 7. Medical technology could clearly show that the twins had 4.5 centimeters of common veins. It was not necessary to expose their brains to find this out. Moreover, what procedures were taken to ensure that the part of head opened (equal to a five dollar bill) supposed to be covered? 8. Why the Safaian's housekeeper's daughter was representing the twins in Singapore? Why was a bank account opened for her? 9. Why the children in the past 2 1/2 years did not contact the Safaian family? Was there an arrangement of some sort which has not been revealed to the public? We understand that certain details would have had to be clarified prior to surgery (for example, questions regarding organ donation), but the secrecy with which Raffles Hospital has surrounded the entire sad affair is very upsetting to us. 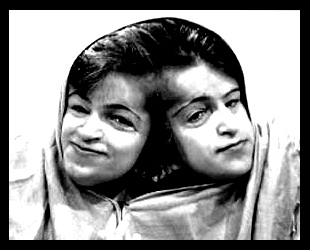 As most doctors in Iran who have expertise in this type of surgery, as well as surgeons in Germany and the USA, would have refused to proceed with the surgery, we believe that secret deals must have occurred in order to transfer the twins to Singapore. Given the tragic results of such deals, we urgently request answers. Dr. Ala is Professor of Production and Operations Management and Director of Productivity Center at California State University, Los Angeles. He is also the President of Iranians for International Cooperation and founder of www.iran-heritage.org and www.iranalliance.org.